Although obsolete, a demi-cannon is still a dangerous weapon to face as it fires a ball with a nominal weight of around 24 pounds. This large calibre makes for a large weapon with a massive gun carriage. Once properly emplaced, a demi-cannon is hard enough to adjust for aim, let alone drag to a new location! 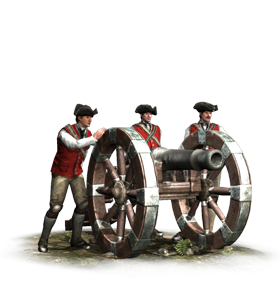 Originally, this lack of tactical mobility was not a problem, as the gun was for siege work or for a battlefield where there was little artillery present. It was unlikely to ever suffer any kind of counter-battery fire, so didn’t need to be moved. Artillery was sometimes incredibly dangerous to its users as well as the targets: fire was a terrible risk. The artillery baggage train usually held an enormous quantity of powder, and any stray spark was liable to cause an explosion. Anyone out of place caught near the powder train could expect little mercy: some generals ordered that enemy agents should be burned alive if caught in an arson attempt, and immediate lynching for their own errant soldiers wandering too near the artillery train!